Students block a vehicle with college staff members during a protest Thursday at the University of California, Los Angeles. Los Angeles, California (CNN) -- Protesters of a tuition hike at University of California campuses stood their ground into Friday night, with 41 demonstrators at UC Berkeley cited for trespassing after their takeover of a campus building. Nearly 100 protesters at UC campuses have been arrested over the past two days in the demonstrations over a 32 percent tuition increase. The demonstrators, students and nonstudents alike, were cited for trespassing, spokeswoman Claire Holmes told CNN. Holmes said those arrested would be cited and released rather than taken to jail, per agreement with student leaders. Three students were arrested earlier at Berkeley in the wake of protests across several campuses that have shaken up the University of California system a day after officials approved a tuition increase to be enacted over the next two school years. The first tuition hike, which takes effect in January, will raise undergraduate tuition to $8,373. The second hike kicks in next fall, raising tuition to $10,302, said university spokeswoman Leslie Sepuka. Students who live on campus could pay up to an estimated $17,200 in additional fees that include the annual cost of books and housing, according to the system's July 2008 finance guide. The January increase of about 15 percent is more than double the average public university tuition hike last year. On average, tuition and fees at four-year public universities nationwide increased 6.5 percent, or to $7,020, since the previous school year, according to data from College Board. Students eligible for financial aid and whose families make under $70,000 will have their tuition covered, the university said. Caitlin Lawrence Toombs, a UCLA student, told CNN she'd have to request additional loans to pay for school and that with her brother starting at Berkeley soon the cost would place a heavier burden on her family. She, too, participated in the student outcries against the increase, she said. And many other students had yet to back down Friday. On the Santa Cruz campus -- where building occupations began last week with a library sit-in -- about 100 students staged a sit-in in the second-floor lobby of Kerr Hall soon after hearing the tuition hike had been approved, according to UC Santa Cruz Provost David Kliger. Many remained there Friday afternoon. The demonstrators made demands, Kliger said without listing them. They would not keep exits clear and broke into some parts of the building, he said, adding they are trespassing and could be arrested. In addition, the students could face suspension or expulsion. "We cherish the principle of free speech," Kliger said. "Regrettably, these actions go well beyond that." At UC Berkeley on Friday morning, students occupied the second floor of Wheeler Hall, UC Berkeley spokeswoman Janet Gilmore said. Campus police broke through a barricaded of furniture and office equipment on the ground floor and arrested three students, she said. An additional 250 demonstrators remained outside Wheeler Hall into the night, according to Holmes. Authorities arrested dozens of angry students on the campus late Thursday after they refused to vacate the school's administration building. The 52 students were taken into custody by the Davis Police Department and deputies from the Yolo County Sheriff's Department, according to Claudia Morain, a UC Davis spokeswoman. The arrests at Mrak Hall, the campus' main administration building, came about four hours after the normal 5 p.m. PT (8 p.m. ET) closing time. At one point, as many as 150 students were at the building protesting the tuition increase, Morain said. UCLA's Campbell Hall was occupied for several hours Thursday evening, a school spokesman said. The takeover was not planned or sanctioned by the main protest organizer -- the United State Student Association, according to USSA representative Gabby Madriz. The same building was briefly occupied Wednesday night by several dozen student protesters, according to a UCLA news release. The building was the site of the 1969 shooting deaths of two Black Panther Party members during an internal dispute, according to the release. The UCLA campus was the scene of the largest and loudest demonstrations Thursday. "We're fired up. Can't take it no more," students chanted as they marched and waved signs at UCLA. "Education only for the rich," one sign read. Some faculty members and campus workers -- worried about furloughs and layoffs to come -- joined the protesting students. "Stop cuts in education and research," a sign carried by a teacher said. After the regents voted, students rushed to parking decks to stage a sit-in to block regents' vehicles from leaving. 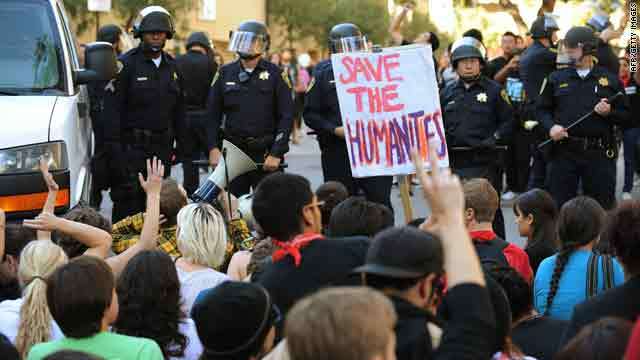 Campus police and California Highway Patrol officers in riot gear stood nearby. As one regent member walked out, students lining his path shouted, "Shame on you, shame on you." The situation ended without incident as students gradually left the scene. University executives told the regents the fee hikes are needed because they've already made deep spending cuts in the past two years -- cuts forced by the state budget. About 26 percent of the $20 billion spent each year by the system comes from the state's general fund coupled with tuition and fees paid by students, according to a summary on the regent's Web site. The fee increases are to be balanced by a raise in "the level of financial assistance for needy low- and middle-income students," according to a statement from the Board of Regents. The tuition hike is expected to raise $505 million for the university system, and about $175 million of that money is to go toward student financial aid, the board said. CNN's Alan Duke, Augie Martin, Greg Morrison and Lynn Lamanivong contributed to this report.